It has something to do with MSG. 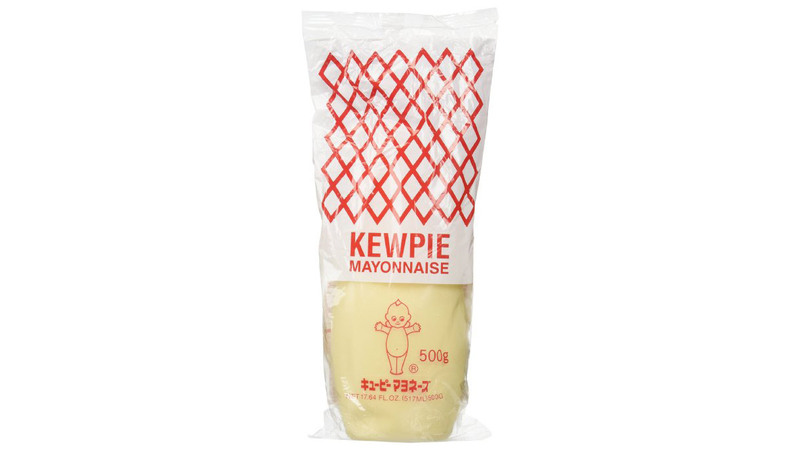 Japan is obsessed with mayonnaise—well, their version of mayonnaise, anyway, a brand called Kewpie. So it's no surprise that they're celebrating with mayo cafes in Tokyo and Nagoya from March 1 to March 31, and April 3 to April 30, respectively. At the cafes, consumers can gaze adoringly at Kewpie bottles strung from broccoli trees, while noshing on vegetables smothered in limited edition Kewpie olive, basil, and tomato-flavored mayo, Kotaku reports. This is at least the second year this mayo has been so revered in pop-up cafes throughout the country. Why does Kewpie inspire such devotion? The answer is actually pretty simple: It contains MSG. As chef and Momofuku founder David Chang once told Food & Wine, Kewpie is "the best mayonnaise in the world, because it has MSG." Kewpie is a little different than American mayo, because it's made with only egg yolks—not whole eggs—and with rice or apple vinegar and no added salt or sugar. It's bottled in a slim red-and-clear container, with an emblematic baby for its logo. But the real secret to Kewpie's cult-following is a healthy dose of MSG. Momofuku's Chang isn't the only chef to adore Kewpie or its MSG content. Chef Dino Tsaknis of Chicago's Primehouse has sung Kewpie's praises, while Jason Halverson of San Francisco's Stones Throw has said, "Kewpie Mayonnaise is like mayo on crack." Halverson uses it in everything from coleslaws to sandwiches and sauces, he says. And Bravo TV star chef Niki Nakayama says she always keeps Kewpie stocked. But don't worry: Whether you're eating out at a restaurant that loves to use Kewpie or you want to add it to your own refrigerator, this mayo's MSG content isn't nearly as bad for you as you might think. Recent studies have shown that MSG, which is a salt formed from glutamic acid, doesn't cause the symptoms for which it's so often blamed, such as headache, nausea, and even numbness. You're more than likely safe to eat it, especially in small servings.